Karen Eckmeier of The Quilted Lizard recently shared with us that her quilt Turning Over a New Leaf was selected as the signature quilt at the upcoming Spring Quilt Market! 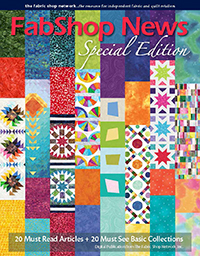 Eckmeier, a designer, teacher, author, and longtime advertiser in FabShop News Magazine, started making art quilts in 1996. Her quiltmaking led to show entries and quickly progressed to award-winning recognition at national and international levels. This spurred her to take the leap in 2002 from having a hobby to starting a business. “Why name it The Quilted Lizard,” you may ask? Eckmeier says lizards have always made her laugh. The cute, tiny, scurrying creatures found their way onto many of her blue-ribbon-winning quilts. She loved people’s smiles and laughs when they looked at her whimsical creations. Not to mention that over the years she had established quite the collection of lizard pins, belts, T-shirts, hats and more. So, naturally, when it came time to name her company, the lizard seemed to fall into place as her mascot. For years Eckmeier has taught in local shops and at workshops nationwide.  She calls her signature techniques “Lay-ered Curves and Accidental Landscapes.” She self-published her latest book, Wiggles & Waves, in 2018. In it the author and designer spotlights free-form curves and celebrates over 20 years of playing with her topstitch piecing technique to create wild curves and dramatic angles. These techniques are also featured in her books Accidental Landscapes and Wearable Waves. Turning Over a New Leaf 2018 (42”x 57”) evolved over several years. I had made well over 100 topstitched Rose Twirls with a Kaffe Fassett millefiori in the center and arranged them on my design wall, only to realize it was not as strong a design as I wanted it to be. So I set the blocks aside for a year until I decided to add my Layered Leaves to them in a totally different design. When I started to sew it together, let’s just say I miscalculated and needed to cut down my leaves to a smaller size. Hence the name of the quilt refers to the fact that I was truly turning over a “new” leaf. And it was also February of 2018 so I was symbolically turning over that new leaf going into the New Year! 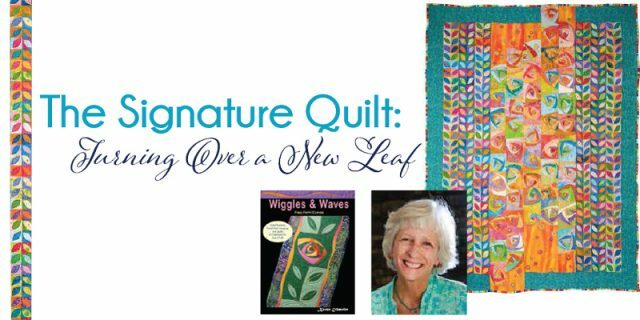 Eckmeier also told us that the instruction to make the Layered Leaves and Rose Twirls featured in The Signature Quilt can be found in Wiggles & Waves. Notice that even the binding “wiggles”—on purpose of course! To learn about the selection process for Quilt Market’s “signature quilt,” we contacted Nancy O’Bryant Puentes, executive vice president at Quilts Inc., to get the scoop. The executive said that any quilt on exhibit is fair game for consideration of the signature quilt. She works closely with her Publications & Public Information and New Media teams on the selection. Quilts Inc. gives no preference to a certain style, usually alternating between art and traditional quilt designs from Market to Market. O’Bryant Puentes said they really just try to pick a quilt that people will find interesting and appealing. will speak to others as well. Seeking a quilt that lends itself to several mediums, the group considers whether the design detail will translate into their logo and pin, and publication covers. Sometimes that’s an easy call, especially with traditional quilts. Other times, especially with art quilts, it isn’t. O’Bryant Puentes works closely with her graphic design teams to color-match, make adjustments, and create something that transmits the overall feel of the design. “It’s all about making the quilt look great!” she says. Keep your eyes peeled for Eckmeier’s beautiful quilt both online and at International Quilt Market in Kansas City, Missouri. The signature quilt will appear on all print publications, including postcards, catalogs and the Buyer’s Guide. The logo design from the quilt will appear in print and online on the Quilts Inc. website, on all email marketing materials, and on signage throughout the show.